I'm an enthusiastic duct taper, and duct tape was my daughter's first craft material. 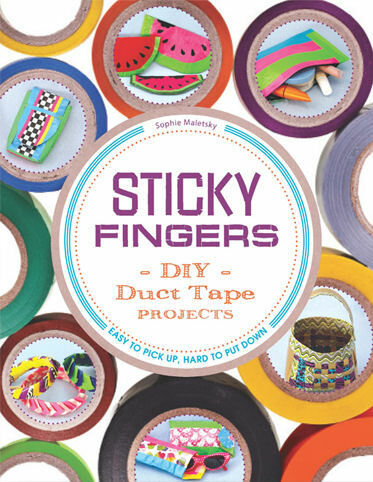 This book is written for people who are just getting started in taping. It starts with the absolute basics, how to make a duct tape sheet, how to use a backing material for bigger projects so you can use less tape, how to make strips, weaving and the packing tape clear window. The first project is a basic pouch. Pouches are a good first project because there is no fold in the middle, and they are the basis for a lot of other projects. She explains how to make the pouch, then a few different methods of closing it. So by the time you are done making all the pouches, you'll have a very good grasp of closing methods for duct tape projects. The projects include a wallet of course. Every duct tape book should have a wallet in it! But there are also flowers, bangle bracelets, purses, frames and pouches. With the variety of tape designs out there (quick obligatory shout out for my personal favorite Retro Owls!) and the projects in here, there are gift ideas for years. There are also tips for using the empty rolls and tiny scraps so nothing goes to waste. This book is written for tweens to teens, and has a lot of photographs and very clear instructions. The author has been writing and designing for that age set for a while. Which means if you're an adult who wants to start working with tape crafts, it should be a cinch to follow. This will give you the basic skills, then you can start designing for yourself. The type at the bottom of the roll on the cover says "easy to pick up, hard to put down" and that's the absolute truth. Duct taping is addictive as a craft. But it's also fairly inexpensive if you save your design tapes for the parts that show and use a backing material or less expensive plain old gray duct tape on the inside of projects. I do recommend this book. My own tip for new duct tapers? A lot of the time you don't have to make packing tape windows because there is so much clear plastic packaging on things that are bought on a regular basis. I save that clear plastic, cutting down to sheets where possible, but some stuff looks good with a bubble window full of confetti or small gumball machine toys too. It can add an extra dimension of whimsy and you get to recycle. Amazon.com affiliate links don't affect your cost, and provide extra income to me personally, which helps support this site. I received a complimentary copy of this book to review, I received no other compensation, and my review is my honest opinion of the book. You can read more about my review policy here. Raspberry White Chocolate Mocha MILKSHAKES!